The TSS (Tethered Satellite System) mission equipment consists of the deployer system, the Italian-build satellite, the electrically conductive tether (22 km total length) and 6 science instruments. The TSS-1 is to be deployed from a reel in the orbiter payload bay upward (away from Earth) to up to 20 km above the Orbiter. develop the capability for future tether applications on the Shuttle and Space Station. The TSS released a satellite while remaining attached to a reel in the orbiter payload bay. This mission was intended to demonstrate control of the satellite during deployment, aerodynamic stability at flight altitude, and the ability of the system to collect meaningful scientific data and to return the data to the Orbiter, and then to the Payload Operations Control Center (POCC). The satellite was to be deployed 20 Km (12.5 miles) above the Orbiter. The deploying equipment consisted of a Spacelab pallet, a reel for tether deployment, an extendible/retractable boom for initial deployment and final retrieval of the satellite, an electrical power and distribution subsystem, a communications and data management subsystem, and a tether control capability. A separate support structure carried science instrumentation. The spherical satellite is 1.6 meters in diameter and 6.5 meters in length. The S-band antenna, magnetometers, and Research on Orbital Plasma Electrodynamics (ROPE) equipment are mounted on stationary booms, and the Research on Electrodynamic Tether Effects (RETE) Langmuir probe and dipole field antenna are mounted on 2.5 meter deployable/retractable booms. At the base of the satellite, a swivel joint and a bayonet pin attache the tether to the satellite. A connector routes the tether conductor to an ammeter and then to the satellite's skin. The satellite contained cold gas (nitrogen) thrusters used for deployment, retrieval, and attitude control. The 2.54 mm diameter conducting tether was constructed using keV.ar and Nomex with 10 strands of 34 AWG copper wire and a Teflon sheath. The deploying system consists of a motor-driven tether storage reel and level wind system. A separate multipurpose equipment support structure (MPESS) carries all science instruments not integrated on the satellite, with the exception of the Tethered Optical Phenomena (TOP) equipment, which is carried in the crew compartment. NASA was reponsible for the TSS deployer and systems integration, and Italy for building the satellite. Five investigations from Italy and five from the USA were selected for the first mission. On the TSS 1 mission, due to a technical problem (a protruding bolt), the tether could only be released to about 840 feet. 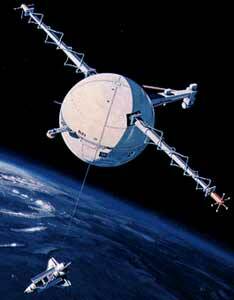 The TSS 1R mission was a reflight of the Tethered Satellite TSS 1. Five hours after deployment began on 25 February 1996, with 19.7 km (of 20.7 planned) of tether released, the tether cable suddenly snapped near the top of the deployment boom. The TSS satellite shot away into a higher orbit. TSS instruments could be re-actived and produced science data for three days until battery power ran out. An independent review panel was formed to review the TSS-1R failure.